Faced with the dual demands of motherhood and poverty, as many as one fourth of low-income minority mothers struggle with major depression. But the stigma associated with mental illness coupled with limited access to quality treatment prevent the majority of these struggling women from receiving help. Now a new study shows that screening for the disorder and providing short-term, relationship-focused therapy through weekly home visits can relieve depression among minority mothers, even in the face of poverty and personal histories of abuse or violence. Such help can have far reaching benefits not only for mothers, but also for their children, say the authors. "It's amazing, really," says psychologist Sheree Toth, lead author and executive director of the University of Rochester's Mt. Hope Family Center. "This research tracked a 14-week intervention for mothers who are terribly overwhelmed, surrounded by high-crime neighborhoods, lacking social support, and often traumatized—my fear was, 'this is never going to work.'" But to the surprise of Toth and her Rochester team, the series of convenient, one-hour therapy sessions relieved depression in participants much better than standard clinic-based care. The study participants also continued to improve eight-months after the treatment ended, regaining a sense of hope and control over their lives and reporting feeling more connected to and supported by others. 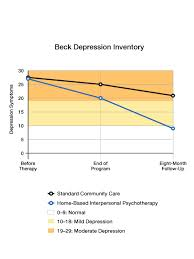 For example, on the Beck Depression Inventory (BDI), a widely used questionnaire in which a score of 19 or above indicates major depression, women in the study group saw their depressive symptoms decline from an average of 27 at the beginning of therapy to 9.6 eight months after the program concluded. By contrast, women who received community care remained clinically depressed, with an average BDI score of 21 at the follow-up. Women who received home-based interpersonal therapy saw their depression subside by the end of treatment and continue to improve eight months later. Women who received standard care experienced much less relief. The results, says Toth, point to the need for screening high-risk populations. None of these women were seeking treatment, but were identified instead through a questionnaire and an interview at physicians' offices and clinics for the Women, Infants, and Children (WIC) subsidized nutrition program. Says Toth: "When I go to the doctor, they ask me if I use my seatbelt. Why would we not be asking questions about depression when we know the chances of being hit by a car are way less than the chances of being hit by depression? People are suffering needlessly." Published online November 8 in Development and Psychopathology, the findings are good news for mothers and their children alike. "Extensive research has shown that young children whose primary caregivers are depressed often begin life on the wrong foot," explains Toth. "They may fail to develop secure attachments, setting them up for a cascade of difficulties, from behavior problems during childhood and failure in school to involvement in the juvenile justice system and major psychiatric problems down the road." Despite the widespread prevalence of depression among minority mothers, researchers have largely overlooked this vulnerable population. "In fact, studies that formed the empirical base for the American Psychiatric Association guidelines for depression treatment included 3,860 participants, with only 27 identified as African American and none as being of Latina descent," the authors write. To address the imbalance, the researchers tracked 128 low-income mothers of one-year-olds, 60 percent of whom were Black, 20 percent Hispanic, and 20 percent Caucasian. In addition to poverty, the vast majority of these mothers faced extensive life challenges. All but 6 percent had been depressed for more than a year, 87 percent reported histories of child abuse, 30 percent had been raped or sexually assaulted by a relative, and 27 percent suffered from posttraumatic stress disorder. The study tested the effectiveness of interpersonal psychotherapy, a short-term depression treatment that has worked with more advantaged populations. "A big part of this approach is instilling hope," says Robin Sturm, a co-author and one of the family therapists who worked on the study. She and other therapists first help clients recognize that feelings, such as a lack of energy or motivation, are symptoms of depression not signs of laziness or other character flaws. "If they can separate themselves from the symptoms, it helps them see that they can get better," says Sturm. The bulk of the intervention then focuses on identifying and easing one or two key relationship problems in clients' lives. This could be overcoming the loss of a loved one, reconnecting with a family member, or learning how to resolve conflicts with a partner. Using a variety of tools, from role-playing to analyzing arguments, participants practice more effective ways to interact. "The aha moment is when these women realize, 'I have a sense of control,'" says Sturm. "Perhaps there is domestic violence. They can't control what the other person does, but they can control what they do. That stuck feeling is the hallmark of depression." A critical element of the study model was to offer therapy in clients' homes, an option chosen by 85 percent of participants. "It sends a powerful message that I am willing to come to you," explains Sturm, who, if needed, also met with clients in her car or drove them to the clinic for their appointment. "When people are depressed, it may be too hard to have the energy to make it to appointments," she says. The program's flexibility also reduced the need for childcare and transportation, resulting in a compliance rate of 100 percent, the authors report. Therapists were also sensitive to the stigma of mental illness in minority communities. If clients appeared uncomfortable with a diagnosis like depression, therapists used terms like overwhelmed or moody instead and stressed that such feelings were common for parents faced with the demands of childrearing. Instead of therapy, they sometimes describe their appointments as "spending some time talking about how you are feeling." The program involved no anti-depressants or other medication, further distancing the intervention from psychiatric care, says Sturm. To assess the effectiveness of this flexible, problem-solving approach, the study randomly assigned a second group of mothers to standard community care, matched by race, education, age, and other factors. The control group received clinic-based counseling or cognitive behavior therapy, a common short-term treatment for depression, along with a variety of other interventions, including medication, support groups, and marital and family counseling. The comparison was clear: home-based, interpersonal psychotherapy lifted depression much more effectively than standard care. The findings underscore the importance of actively screening and offering culturally sensitive, convenient care for our most vulnerable populations, says co-author Fred Rogosch, associate professor of psychology at the University of Rochester and director of research for Mt. Hope Family Center. In one clinical trial, 83 percent of low-income young minority women referred for treatment for depression did not attend even one session. "Most of these women don't even like to talk about depression. Most of these women would never have asked for treatment," says Rogosch. "When I go to the doctor, they ask me if I use my seatbelt," says Sheree Toth. "Why would we not be asking questions about depression when we know the chances of being hit by a car are way less than the chances of being hit by depression? People are suffering needlessly." "We also are concerned about the children of mothers who feel isolated, helpless, and angry. That is not the ideal emotional environment for infants and toddlers to grow up in. Reaching out to these mothers is critical for their children," says Rogosch. Even with the creative accommodations offered in this study, Rogosch notes that 40 percent of mothers identified as depressed declined all care. The authors suggest that future research should explore ways to make the interview process even more welcoming. Assaf Oshri and Julie Gravener from the University of Rochester and Antonio Alexander Morgan-López from the University of North Carolina at Chapel Hill also contributed to the paper. The research was supported by the National Institutes of Mental Health, grant MH091070 LPC Continuing Education About the University of Rochester The University of Rochester (www.rochester.edu) is one of the nation's leading private universities. Located in Rochester, N.Y., the University gives students exceptional opportunities for interdisciplinary study and close collaboration with faculty through its unique cluster-based curriculum. Its College, School of Arts and Sciences, and Hajim School of Engineering and Applied Sciences are complemented by its Eastman School of Music, Simon School of Business, Warner School of Education, Laboratory for Laser Energetics, School of Medicine and Dentistry, School of Nursing, Eastman Institute for Oral Health, and the Memorial Art Gallery.